The RaptorLIFE project area is in North Cork taking in parts of East Kerry. Much of the on-the-ground works, wildlife surveying and monitoring and stakeholder engagement will take place within the Stack’s to Mullaghareirk Mountains, West Limerick Hills and Mount Eagle Special Protection Area (SPA – Site Code: 4161). The SPA is designated for the conservation of the Hen harrier. Within this SPA the River Blackwater rises. A short distance from its source, the rest of Blackwater is designated as a Special Area of Conservation (SAC – Site Code: 2170). 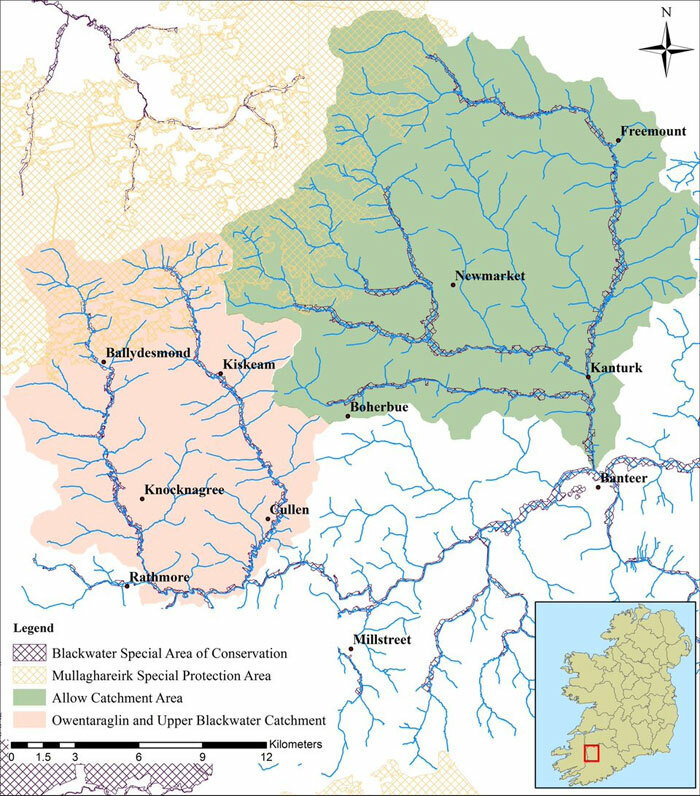 The River Blackwater (Cork/Waterford) SAC is designated for the conservation of the Freshwater Pearl Mussel and other species of EU importance such as Atlantic salmon and Brook lamprey. The project will cover the River Blackwater from its source and the River Owentaraglin to where the two rivers meet, at the Shamrock Bridge near to the village of Cullen. The RaptorLIFE project is adjacent to that of the project area in Duhallow LIFE. The unifying of work on these important catchments of the River Blackwater cannot be overstated. The aspiration for the RaptorLIFE project would be for similar progress as DuhallowLIFE SAMOK, such as Catchment Management process and 'Locally Led' agri schemes, to follow into the Raptor LIFE catchment. Also, it is an objective of this project is to bring together communities living in Duhallow and wildlife experts to address the serious decline of Hen harriers in Duhallow. This can be achieved by restoring habitat through an integrated network of actions across important Natura 2000 sites (SPAs and SACs) for Hen harrier and other species. These two designated Natura 2000 sites will be linked through local participation via direct engagement, involvement of local stakeholders and participants of work schemes.